Children aged 6 months to less than 5 years (i.e. the day before they turn 5) can receive the flu vaccine for free. Children aged 6 months of age and over with medical conditions putting them at increased risk of severe influenza and all Aboriginal and Torres Strait Islander children 6 months of age and over can receive the flu vaccine for free. Flu is a highly contagious disease. Children are at risk of serious health complications if they get flu. Influenza, commonly known as flu, is a highly contagious disease caused by the influenza virus. Children are at higher risk of serious complications from flu. It is strongly recommended that children aged between six months and five years are immunised against the flu every year. 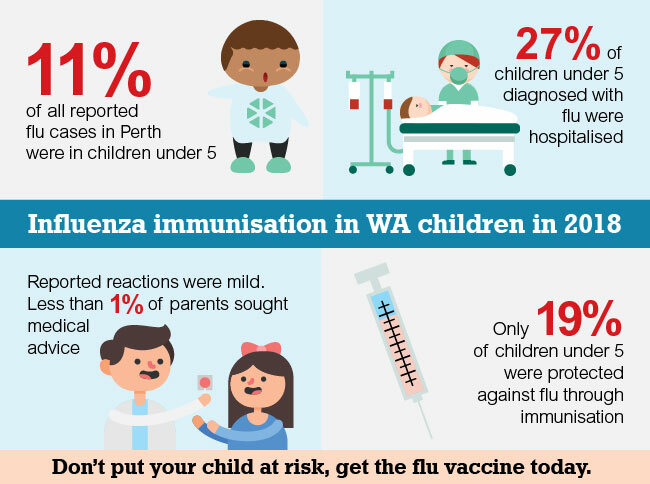 Watch the video below to learn about why flu immunisation is so important for children. Why should children get the flu vaccine? Rates of flu infection and hospitalisation are highest among young children. Children who become infected with flu can develop serious illnesses, including convulsions (seizures or fits) and diarrhoea. The majority of childhood flu-related hospitalisations and deaths occur among children without underlying medical conditions. The flu vaccine is available in metropolitan and country WA from immunisation providers including GP clinics, community health clinics and Aboriginal Medical Services. Contact your GP or immunisation provider. Learn more about the flu vaccine, including vaccine safety and what’s new for 2019. Got more questions? Read the FAQs. View and download the flu (influenza) vaccine fact sheet (PDF 343KB).